Is low volatility a crowded trade? Concerns have been raised about investors ‘chasing performance’ by investing more into expensive factors like volatility and could suffer from a sharp reversal of this trend. State Street Global Advisors offers a somewhat different view. Recent commentaries have raised concerns about crowded trades that could adversely affect smart-beta strategies. The main argument is that investors have been ‘chasing performance’ by investing more into expensive factors like low volatility and that a sharp reversal of this trend (mean reversion) is likely to hurt portfolios. We, at State Street Global Advisors, think some aspects of this argument may be overstated. First, let’s examine the premise of the above argument. It is also important to keep in mind the different construction methodologies and historic returns of indexes that are fundamentally weighted and have been underperforming recently, as compared to smart-beta strategies that are factor tilted. Valuation is a relatively good indicator of long-term (five-to-ten-year) performance. When valuations are low relative to history, there is a greater chance of mean reversion to the upside and a pay-off in following periods. According to this metric, some smart-beta strategies, such as quality/low volatility, are currently expensive, while value specifically is very cheap. Investors need to think about ‘sources of return’ and whether they come from fundamentals or from valuation expansion. In terms of equities, this would be the equivalent of asking whether better performance of an index has been driven by a multiples expansion (increasing price-earnings ratio) or from improving fundamentals (such as earnings per share or dividends). Based on this distinction, there are concerns that where investors have been ‘chasing performance’, the value of certain factors or styles is likely to reverse, in the absence of support from fundamentals. Concerns on this front have focused on low volatility/quality factors. So-called “performance chasers” are expected to drive greater-than-normal dispersion in valuations, and therefore a reversal could be commensurately more damaging. We believe volatility is an expensive trade on a relative basis, but not at an extreme level and certainly not compared to historically high-volatility periods such as 1998/99 or 2008/09. Indeed, given the increase in volatility over the last few months, we would expect investors to pay a premium for low-volatility assets that can provide a hedge against market downturns. In terms of ‘performance chasing’, more assets have been moving into low-volatility stocks, but from a very low base, and not in nearly as large volumes as assets invested into dividend-based or growth stocks (see figure 1, left). 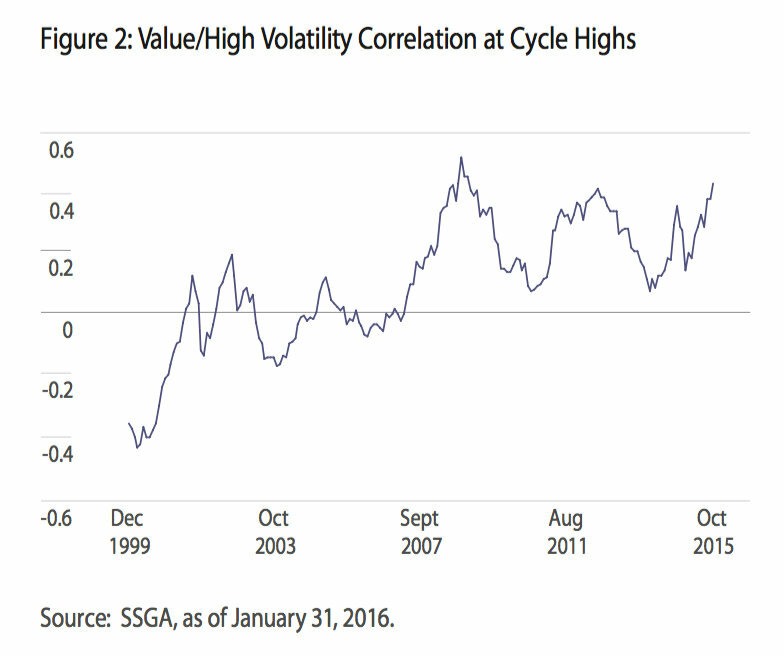 At the same time, we are concerned about the very high correlation between value and high-volatility factors, which are at a cyclical high (see figure 2, below). As a result, investors might want to consider allocating more to value. Alternatively, investors may consider investing in a strategy that inherently provides low-volatility exposure but balances it out with other factor-based sources of excess returns over traditional benchmarks, such as those associated with value, quality and sentiment. Invest in factors that have been well researched and documented over time with a strong investment thesis that they will deliver a durable premium versus a market-cap based index over the long term (five to ten years). As research has shown, factor premia accrue over the long term, and investors must keep that long time horizon in mind when investing. We are always focused on valuations across our smart-beta strategies, and it is important to understand that there might be intermittent periods of underperformance precisely because of mean reversion in valuations. Rather than ‘chasing performance’, investors in smart beta may prudently diversify across a mix of factors to address cyclical changes in performance. The author, Gaurav Mallik, is Global Head of Equity Strategies at State Street Global Advisors. The views expressed in this material are the views of Gaurav Mallik through the period ended 26 February 2016 and are subject to change based on market and other conditions. Low-volatility funds can exhibit relative low volatility and excess returns compared to the index over the long term; both portfolio investments and returns may differ from those of the index. The fund may not experience lower volatility or provide returns in excess of the index and may provide lower returns in periods of a rapidly rising market. Active stock selection may lead to added risk in exchange for the potential outperformance relative to the index. The fund employs a value style of investing that emphasises undervalued companies with characteristics for improved valuations, which may never improve and may actually have lower returns than other styles of investing or the overall stock market. A “quality” style of investing emphasises companies with high returns, stable earnings, and low financial leverage. This style of investing is subject to the risk that the past performance of these companies does not continue or that the returns on “quality” equity securities are less than returns on other styles of investing or the overall stock market. This document may contain certain statements deemed to be forward-looking statements. All statements, other than historical facts, contained within this document that address activities, events or developments that SSGA expects, believes or anticipates will or may occur in the future are forward-looking statements. These statements are based on certain assumptions and analyses made by SSGA in light of its experience and perception of historical trends, current conditions, expected future developments and other factors it believes are appropriate in the circumstances, many of which are detailed herein. Such statements are subject to a number of assumptions, risks, uncertainties, many of which are beyond SSGA’s control. Please note that any such statements are not guarantees of any future performance and that actual results or developments may differ materially from those projected in the forward-looking statements. ©2016 State Street Corporation. All Rights Reserved.